When one of my friends in our ministry saw that I was starting this blog, she wrote and exclaimed, “LOVE it. So great- can’t wait for you to spill your beans on the screen. 🙂 ” Well said. What might look like good soup to me, in reality, is probably just a mess of spilled beans on the screen. I’m still encouraged, however, because I know there’s at least one who doesn’t mind me spilling beans. 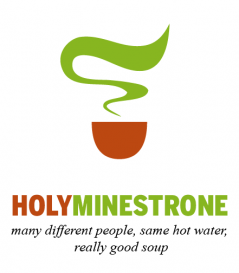 So, let’s start cooking (or spilling) here through Holy Minestrone. Thanks for reading and please feel free to reply or comment. Cooking with friends makes the kitchen really enjoyable. Just ask my wife — I keep her company while she does the cooking all the time. I’ve never heard Christian believers say, “I just want to be deeply connected and involved in a lousy church.” No. The opposite is true. We all say, “I want to be in a great church!” But often, we get the program confused with the mission. So, what’s the secret ingredient to being a part of a great church? Christian community begins at home. Great churches are made through redeemed homes. If a home is passionate about Jesus, his presence fills that family and makes it his church. Really, the one, must-have ingredient of any church is the magnified presence of Jesus. And, if Jesus can be encountered like that in your home, the front door of your house becomes the front door of his church. I think Jesus even claims to be the Door to where we family (John 10:7,9). The redeemed, Jesus-filled family — there’s just no other recipe like it on Earth. Upcoming: a book recommendation & more beans on the screen. Well said about the magnified presence of Jesus. It seems that too often in our families Jesus is more a stranger than the host or central figure. Even as a committed Dad who desires to have Christ in the home, I easily make it all about me. It does also challenge me to consider that our churches are a reflexion of our homes. If Christ is not present in the home, then it is no surprise that He is not present in the church community. Thanks for spilling the beans and reminding me about the preeminence of Christ at home. Thanks for sharing the note, Mike. I’m blessed to know you’re challenged and encouraged! I’m also striving to go a little further with the thought about the church. You mentioned that our churches reflect our homes. It’s true and I see the point. I’d also like to emphasize that our churches *are* (include) our homes once we are redeemed (more than reflections – “realities”, if you will). The nuclear family (husband, wife, kids) functions in the “small family” — and the “large family” contexts. The point I’m trying to make is that we should view these large and small family contexts as two sides of the same coin. The coin is the family with the magnified presence of Jesus.To put it another way, when I think of the word “church” — I need to start with my family of four and move toward my larger church family (of Serenissima). My smaller church family should be devoted to our larger church family because they go hand-in-hand together. At the same time, much of what people “reserve for church” can and should be practiced in and through our family and our home.does that stir the pot a little more?– again, I enjoy the discussion and thanks for the feedback. “If Christ is not present in the home, then it is no surprise that He is not present in the church community.” I think that pretty much sums up the mile wide, inch deep state of the modern church. Personally, I want to be challenged constantly to grow and deepen my relationship with Christ, grow and deepen family relationships, and then grow and deepen relationships with others in the body of Christ. I should be helping the church accomplish that, and the church should be helping me accomplish that. Two sides of the same coin united in purpose. Good word, Ed. I liked that emphasis on “united in purpose” … that purpose releases us to grow more deeply within our redeemed relationships and then outward toward others being reconciled into the greater family of Christ.